What’s the Best Tripod for Vlogging? You’ve got ideas, you’ve got your camera, now you just need to get the right tripod for your vlogging adventures. However, after half an hour of research you’re frustrated: There are hundreds if not thousands of tripods on the market - so which one should you choose? If you’ve found yourself in this dilemma, don’t worry. In this article we’re going to take a look at 5 popular vlogging tripods that will make your life easier. Do you really need a tripod for vlogging? When it comes to vlogging, there are two main scenarios. In these types of videos, the job of the tripod is simply to hold your camera at the right height and angle. While you could theoretically do that with a pile of books or boxes, it is not only much easier to set up the right position with a tripod, it is also much safer. 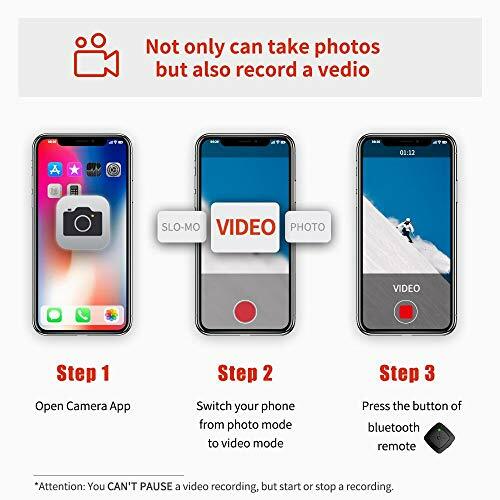 While you can definitely film yourself on the go without using a tripod, it is usually much more exhausting than if you use one. Without a tripod, you will have to hold your arm pretty high up to get a good angle. This can require quite a bit of stamina, especially if your camera is on the heavier side (DSLRs!). A tripod can help you hold your camera at a good angle without much effort and without having to twist your wrist. And most importantly, a tripod will make it much easier to capture smooth shots! To create on the go videos, many vloggers actually use monopods (or selfie sticks), mini tripods or so-called gorillapods. In the review below I included two mini tripods and a gorillapod, which are perfect for this purpose. What makes a good vlogging tripod? Depending on what kind of vlogs you’re planning to shoot, you need to be looking for different kinds specifications. Some tripods possess pan heads or fluid heads, which allow you to turn the camera in different directions and give you the possibility of creating smooth motion shots. Since that’s not something every vlogger needs, this article focuses mostly on tripods with a static head (although it also includes one tripod with a pan head and one with a fluid head). If you’re more interested in moving shots, check out my article on the best video tripods. If you’ve ever watched a Casey Neistat video, you have probably come across a Joby GorillaPod before. In the last few years, these handy gorillapods have conquered the vlogging world - and there are several reasons for that. First of all, it’s important to note how this tripod differs from other mini tripods on the market. Each one of the little balls in its legs is a segment that can be turned upwards, downwards and to the side. This means that the legs of this tripod are completely flexible. This comes really handy when you’re a travel vlogger or want to take your camera outdoors, where you might not always find perfect, flat surfaces. What’s even more practical than the wrapping feature is that the GorillaPod Hybrid weighs only 0.42 lbs. (190g) and can hold a weight of up to 2.2 lbs. (1kg). For most vloggers this will be sufficient - however, if you own a heavier rig or want to shoot with a very lightweight camera, there are both lighter and heavier versions of the GorillaPod available. Thanks to the rubber-coated balls, the Joby GorillaPod Hybrid is also easy to hold. You definitely don’t need to worry that it will slip out of your hands. Although you might not need to use this as a vlogger, it’s good to know that it’s possible to tilt the head by 90 degrees and pan it by 360 degrees. Don’t expect smooth motion from this little tripod, though! At 10.12 inches (25.7cm) long, the Joby GorillaPod Hybrid fits perfectly in any backpack, which makes it great for travelling vloggers. While you can do sit down videos with this tripod, I would mainly recommend it for on the go vlogs. You can get the Joby Gorillapod Hybrid here. Thanks to the rubber coating of the legs, the Ufo 2 sticks to surfaces easily and can also be held comfortably in your hand. I couldn’t find any information about how much weight the Fotopro Ufo 2 Tripod is made to hold. I personally use it with my Canon 700D, which weighs 1.28 lbs. (580g), a 24mm lens with a weight of 0.28 lbs. (127g) and a Rode Rycote VideoMic at 0.48 lbs. (217g) and haven’t had any problems with it yet (in fact, it makes a very stable impression!). However, if you use a heavier camera or long lenses, make sure you find a stable position before you let go of the tripod. Better safe than sorry! The Fotopro Ufo 2 Tripod weighs about 0.72 lbs. (331g) so it is heavier than the Joby GorillaPod. However, with a length of 11.81 in (30cm), it is still a good size to use as a travel tripod. 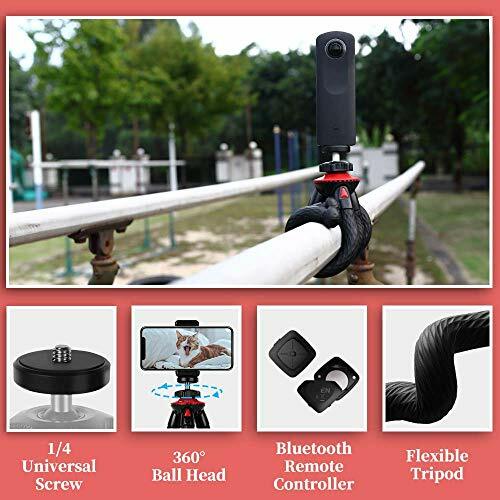 One great feature of this tripod is that it comes not only with a regular camera mount but also a cell phone mount, an action camera mount and a bluetooth remote. So if you’re planning to shoot with your phone or GoPro, you won’t have to buy an additional adapter. Like the Joby, this is more of an on-the-go tripod, even though you could theoretically use it to shoot sit down videos. Choosing the right one for you will probably depend on your taste. I personally like the Ufo 2 a tad more because it’s very nice to hold and its legs are completely flexible. However, both tripods are popular with many YouTubers and are good choices if you’re looking for a flexible tripod that you can carry around easily. You can get the Fotopro Ufo 2 here. 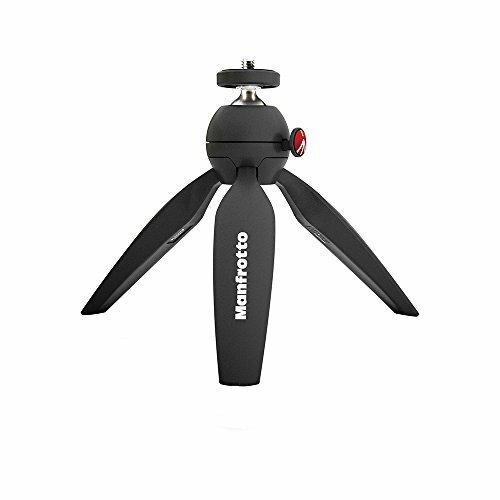 Manfrotto is a brand that is known by professional photographers and videographers for their high quality tripods. And even though the Manfrotto MTPIXI-B PIXI Mini Tripod is not exactly targeted towards professionals, it does not disappoint! Let’s take a look. The first thing that stands out when looking at the MTPIXI-B PIXI is its small size. At a height of only 7.3 in (18.5cm) and a weight of 0.51 lbs., it is perfect for any vlogger or traveler who prefers their equipment to be small and lightweight. The three legs can be folded in and out easily. When you fold them out, the Manfrotto MTPIXI-B PIXI makes a great, stable desktop tripod, which can hold up to 2.2 lbs. (1kg). If you fold them together, you can hold it like you would hold a monopod. One of the best features of this tripod is how easy it is to change angles and the fact that it can hold your camera securely at extreme angles. That’s also why the MTPIXI-B PIXI is especially popular with photographers. So if you like taking photos in addition to your vlogging ventures, this tripod could be interesting for you. While the size of the Manfrotto MTPIXI-B PIXI can be an advantage, it can also be a disadvantage for vloggers - especially if you’re using it as a desktop tripod. It’s simply not tall enough to film yourself at eye level. And if you want to use it on the go, you will have to hold it up higher than you would if you used a different tripod. Whether that will pose an issue for you will depend on your setup and preferences. However, if you’re not sure whether the size will be big enough, I would recommend getting one of the other tripods. You can get the Manfrotto MTPIXI-B PIXI by itself or with a cell phone holder. The Albott 70 Inch Tripod is especially interesting for vloggers because of one special feature: The center column can be turned into a monopod! This means you can use this tripod both for static shots at home as well as on the go. Having said that, it’s important to note that the size of the monopod is a minimum of two feet (60cm) long when it is folded up (and 66in or 162cm long when extended). This might be a little longer than most vloggers would like to carry around. But even if you find the monopod too long for you, the tripod itself is still a good choice if you’re looking for something to shoot sit down videos with. One of its best qualities is how stable and sturdy it is compared to other tripods in the same price range. While most tripods at this price point are made completely out of plastic, the Albott 70 Inch Tripod is made mostly out of aluminum with only a few plastic parts. The 3-way pan head makes it easy for you to adjust the angle of your camera, and you can also use it to pan, tilt and swivel. This is usually not needed for simple vlogs, but can be very valuable when you want to shoot b-roll or more cinematic footage for short films, sketches, etc. The Albott 70 Inch Tripod has a load capacity of 8.8 lbs. (4kg), which should be more than enough for most vloggers and YouTubers. To add to the safety of the stand, the feet are coated with rubber. All in all, this is a good, sturdy tripod that will help you shoot static videos of all kinds. It can also help you do simple panning and tilting shots, which can be nice to add as b-roll. The main drawback is probably the plastic parts, which might not last forever. You can get the Albott 70 Inch Tripod here. Now we’re getting into professional territory. The Manfrotto MK190X3-2W comes with everything a vlogger could need for shooting at home. While this tripod is not made for on the go vlogs, it has a few great advantages over the Albott 70 Inch Tripod when it comes to other types of videos. The most interesting feature is the fluid head, which will allow you to pan and tilt your camera in a smooth motion. This is perfect for filming professional looking b-roll material, short films and sketches. The tripod is stable and durable, with all essential parts being made out of aluminum. At a weight of 6.06 lbs. (2.75kg), it’s not going to weigh down your luggage too much if you want to change locations. The one thing that’s missing here to make it a little more portable is a bag. 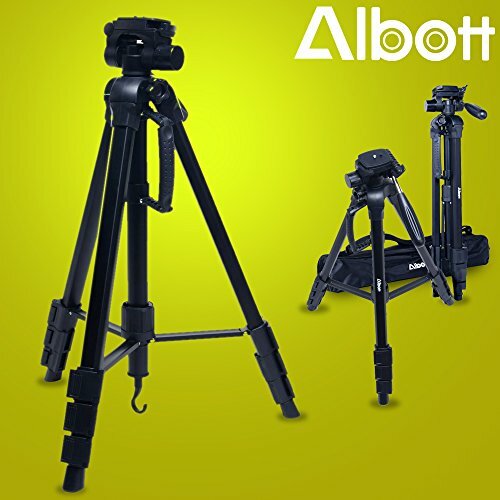 If having a bag is very important to you, the Albott 70 Inch Tripod might be a better choice. Even if you use a heavier rig or bigger lenses, the Manfrotto MK190X3-2W is a safe choice: It can carry up to 8.81 lbs (4kg) of weight safely. The maximum height at 67 inches (170cm ) should be enough to get all the shots you need. While this is a great tripod, not every vlogger needs this level of professionalism (especially if you’re just starting out!). So if you feel like getting the Manfrotto MK190X3-2W would be overkill, the Albott 70 Inch Tripod might be a good alternative. 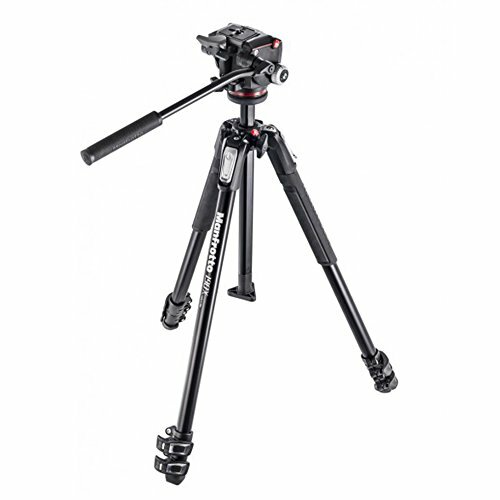 You can get the Manfrotto MK190X3-2W here. Also, if you’d like to check out other video tripods with pan or fluid heads, I wrote an article where I’ve covered tripods for video more extensively. Review Results - What’s the Best Vlogging Tripod? If you want to walk around with your tripod, I personally recommend the Fotopro Ufo 2 Tripod. Although it is a little heavier than the GorrillaPod Hybrid, I like how flexible its legs are and how stable it is. If you film yourself predominantly at home doing sit down/talking head types of videos, the Manfrotto MK190X3-2W would be my choice. I love how stable it is and that you can get smooth moving shots as well. That said, if you’re looking for something more simplistic, the Albott 70 Inch Tripod is a good option! What’s your favorite tripod for vlogging? If you’re currently using a tripod, let us know how happy you are with it in the comments! Also, let me know if you have any questions.